Superstar Janet Jackson’s State of the World tour is on its second leg. Droves of fans filed into the Riverbend Music Center in Cincinnati, OH on Sunday evening. Everywhere you looked, fans had homemade Janet Jackson t-shirts, posters, and all kinds of memorabilia celebrating their favorite pop diva. 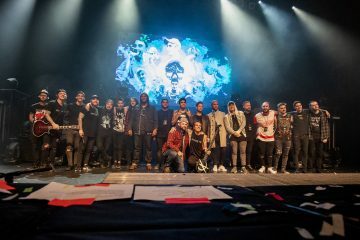 One woman had a hoodie dress printed in Janet Jackson photographs and album covers and several others donned similar hairstyles to the one Janet wore during her performance. DJ Aktive spun famous 80’s and 90’s hits, occasionally throwing in some dance classics to get the crowd on its feet. Audience members excitedly cheered as the crew took their positions on stage, shortly followed by the band. Screens slowly descended from the rafters. Despite the looming threat of thunderstorms, there was zero chance of dampening the high spirits and anticipation. The show began with a video, a commentary on the current social and political climate. The crowd whooped and hollered in agreement as they heard words from great leaders of the past, including MLK, reminding us all to choose peace and love. Then, the music for “The Knowledge” blasted over the soundsystem and a tiny silhouette appeared behind the stage right screen. Janet Jackson took the stage by force for a solid 90 minute show, give or take only a few minutes for quick wardrobe changes. From the moment she stepped out from behind the screen, Ms. Jackson gave an unforgettable and flawless performance. She danced with the highest energy, supplemented by her amazing backup dancers. The choreography was on point. Hit after hit, Janet Jackson did not fail her fans. One particular performance stuck out among the rest. The mood became real and somber for a moment when she performed “What About”. As Janet crooned, her dancers performed a story of an abusive relationship. As the male dancers would exhibit the behavior of abusers, the women, in unison with the strong refrain, would stand up to them and take their voices back. As they danced and the song went on, tears began to fall on Janet’s face. She was fully emotionally pulled in by the song. This was a performer who felt was she was doing. Janet Jackson did something rare: she put an uneasy subject right in people’s faces and did it with emotional truth. “What About” is an important song and she was able to express her truth with the words and visuals in a way that not many other singers can. After “What About”, followed by “You Ain’t Right”, Janet Jackson turned her set back around to the uplifting experience it was before. Nobody in the packed amphitheater could stand still as they heard the electric intro for “If”. As if that weren’t enough, everyone lost their minds when they saw Michael Jackson’s face grace the screen for the classic “Scream”. She ended her set with “Rhythm Nation”, but fans kept screaming for more. Janet ran onstage to close out her show with “State of the World”. Janet Jackson is a true superstar. She delivered a flawless, high energy performance for an hour and a half. She sang with emotion and danced with soul. But what really stands out about her among other high-caliber performers, is how she seemed so grateful to her fans and the people surrounding her. Her dancers each got solos to demonstrate their own style and skills. She was all smiles as she looked out at the crowd and blew kisses to her fans. She introduced her backup dancers and band, as diverse a group as her fanbase, one by one at the end of her show. Janet Jackson truly seems to care about the people in her crew and in her fanbase. That is why she is a superstar. 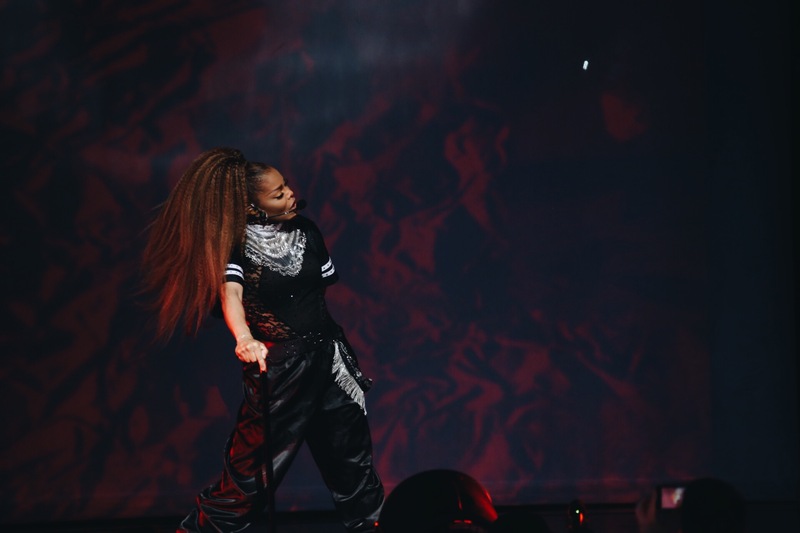 Janet Jackson’s State of the World tour continues through mid-August. 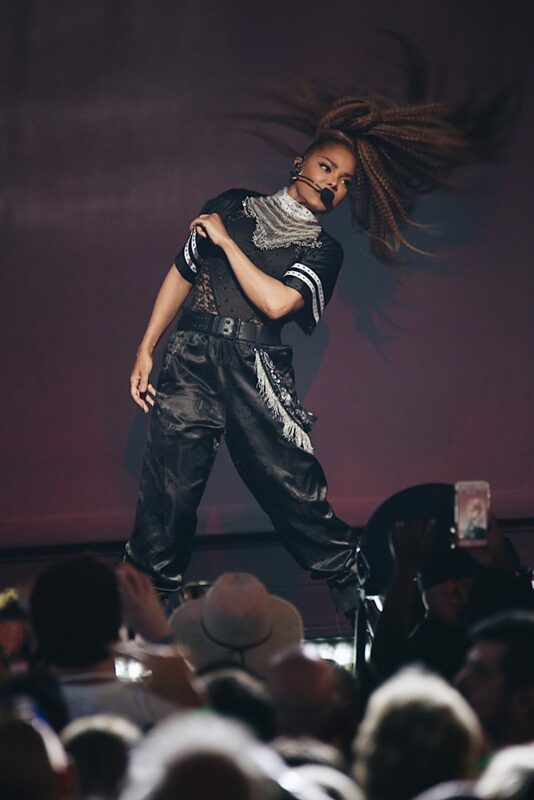 You can check out the tour dates at https://www.janetjackson.com/tour. If you missed her this time around, make sure you don’t miss her when she comes near you again. Janet Jackson is truly a legend.